Mass media all over the world are filled with news that the rate of СО2 in the atmosphere has reached its historical maximum. 97% of global research proves that mankind is to blame for the irreversible climate change, Guardian has reported recently. Environmental NGOs believe that urgent abandonment of fossil fuel in favor of renewable power and energy efficiency can mitigate the consequences of the climate change. Researchers from the Scripps Institution of Oceanography at UC San Diego have published data on higher carbon dioxide concentrations in the atmosphere of the Northern hemisphere. The researchers’ conclusion is based on the longest observations of greenhouse gases in the atmosphere in the history of science. Measurements are done by a station located at the Mauna Loa volcano in Hawaii. 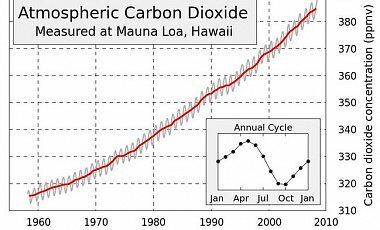 The first data was obtained in March 1958 when the carbon dioxide content was 316 ppm. Interestingly, in the past 800 thousand years that number had never exceeded 300 ppm. According to the researchers, by the beginning of the industrial revolution era the rate was close to 280 ppm, after which mankind started burning fossil fuel on an industrial scale. Despite all the warnings, abandonment of the carbon dependence remains a dream, and the speed at which the carbon dioxide concentration in the atmosphere grew in the past century is unprecedented in the geological history of the planet. Today, the carbon dioxide concentration has increased by a quarter and amounts to already 400 parts per million. According to the researchers, such rates existed on Earth about 3 to 5 million years ago, before the last ice age. “Last year, all our stations in the Arctic also showed a CO2 rate of 400 parts per million. But this is the first time we have a rate this high in the Southern hemisphere,” said James Butler, Director of the Mauna Loa laboratory. The new data have made scientists speak of the greenhouse effect problem again. “We are moving to a prehistoric climate, which can cause enormous and potentially catastrophic risks for mankind,” said Bob Ward from the Climate Change and Environmental Research Institute in London to the AFP agency. “The history of the Earth has not yet known such precedents,” confirmed Michael Mann, Director of the Earth System Science Center at Penn State University. The only way to meet this number is urgent transition of the global economy from fossil fuel to renewable power sources, energy efficiency, and sustainable consumption in all sectors (agriculture, transport, manufacture, etc. ), believe activists from the 350.org group (http://400.350.org/#1	). Environmental NGOs all over the world agree with this statement. The Climate Secretariat of the Russian Social and Environmental Union and environmental NGOs of Russia, Ukraine, and Belarus have written the same thing in their statements many times. “Subsidies for nuclear power and fossil fuel must be redirected to state support of production of renewable power sources and equipment for them, energy saving materials for construction, and energy-efficient machinery,” they say.